You’re probably already aware of a major incident yesterday at the Grand Bahama Shipyard in Freeport, Bahamas. A large crane at dock 2 collapsed onto the aft section of Oasis of the Seas at the beginning of dry dock. This forced everyone to be evacuated from the ship as it also listed towards the starboard side. You can read our original breaking news post right here. Bahamas Paradise Cruise Line which offers short cruises from Port of Palm Beach to the Bahamas has been involved in helping crew members of the Royal Caribbean operated Oasis of the Seas. Grand Celebration was in Freeport at the time when the crane fell onto the Oasis-class vessel. In a letter to guests posted by WPBF 25 News, the ship welcomed the crew members after they were unable to return to Oasis of the Seas with all their belongings onboard. The ship remained in port longer to provide humanitarian relief. As a result, the Bahamas Paradise Cruise Line operated ship was delayed by 2-3 hours arriving back into Port of Plam Beach, Florida. 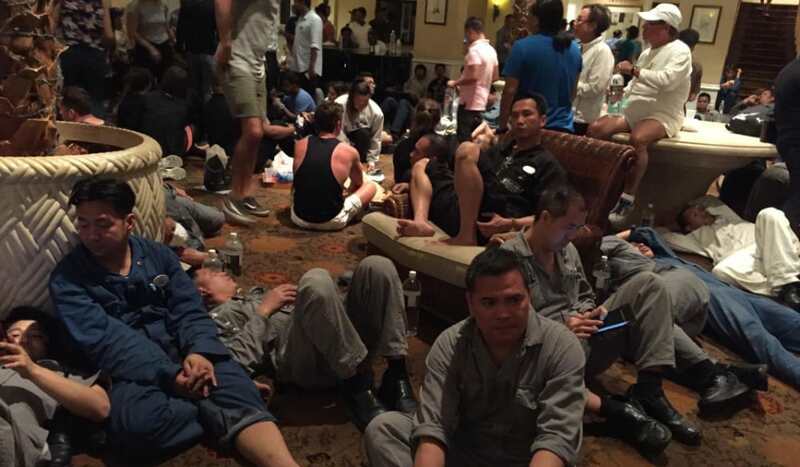 The Grand Classica will be acting as an overnight hotel for the @RoyalCaribbean crew, according to an email obtained from the ship’s leadership. Another cruise ship named the Grand Classic which the same cruise line operates is going a step further by looking after the approximately 1,200 crew members from Oasis of the Seas overnight. The ship is acting as a hotel for the stranded crew and is offering dinner, lunch, and breakfast. The ship captain has also asked the Grand Classica crew members to help in any way they can by providing a toothbrush, phone charger or anything else to make things easier for them. This is developing news and Royal Caribbean is expected to release a new statement at around 5:00 PM EST including details of the damage done to Oasis of the Seas which is one of the world’s largest cruise ships. Grand Celebration is returning to the Bahamas Paradise Cruise Line fleet after being chartered for the past two months.